Today, PHP is used by more than 80% of all the websites whose server-side programming language we know. Popular websites such as Slack, Etsy, Cloudflare, Tesla, Wikipedia, WordPress.com, Tumblr and this website are all powered by PHP. With such a large share of the web, it may or may not surprise you that more than 90% 88% [updated 15th Dec 2017] of PHP based websites are still using PHP 5. Of that 90%, less than one quarter are running the latest supported version of PHP 5 (PHP 5.6). 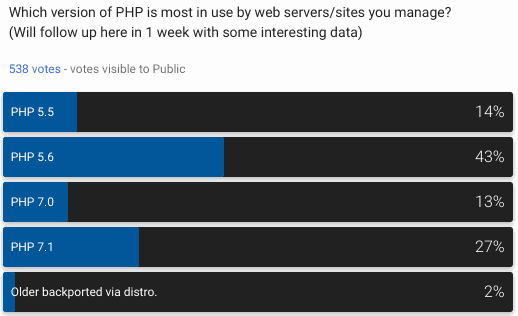 In addition, even though PHP 7 was released more than a year ago and although it’s well documented/benchmarked as being up to 2x faster than PHP 5.6, only around 3% of PHP based websites currently use PHP 7. Last week I wrote a short article “Optimize PHP with finely tuned IT resources and settings” which highlights how to identify bottlenecks which affect PHP powered apps and a few easy PHP optimization tips. Lastly, a healthy discussion covering all sides of this issue can be read here. Remember, avoid the trap of delaying the inevitable, PHP 5 will in time lose support and become more of a pain to maintain.